Cold winter days call for warm hearty soups! My husband only considers soup a main dish when it is loaded and this one fits the bill perfectly. 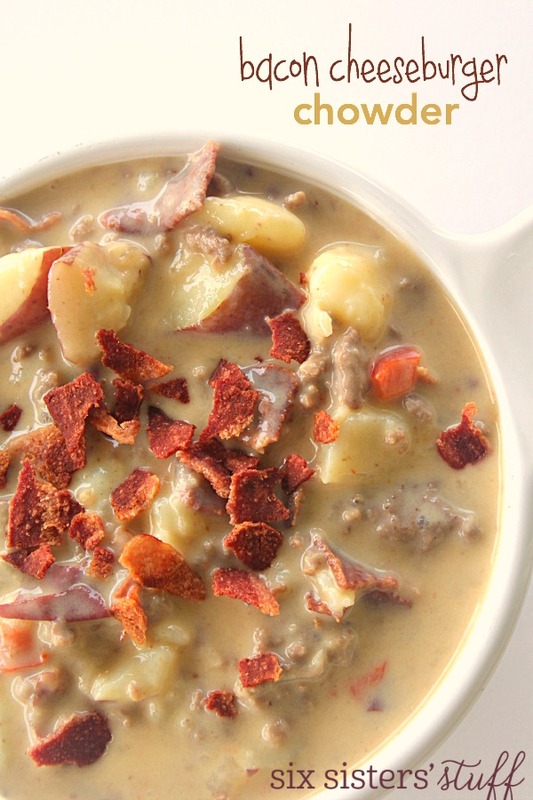 All the goodness of a bacon cheeseburger in a delicious chowder – soup will never be the same. A hearty soup that will warm you up and fill you up! In a large stockpot, cook beef, onion, and red pepper over medium heat until beef is no longer pink (about 6-8 minutes). Drain grease and add in garlic and cook for 1 more minute. Slowly stir in milk, then add in potatoes, water, and bouillon granules; bring to a boil. Reduce heat, cover, and let simmer for 15-20 minutes or until potatoes are tender. Ladle into bowls, and top each bowl of soup with crumbled bacon. It has been a very long time since I've had a chowder. This looks delicious though, anything with bacon gets a yes from me xD Happy new year! I'm going to attempt this with "real" cheese, as i don't have any velveeta on hand. I also don't have beef bouillon granules on hand, so i might try chick bouillon cubes or beef stock. Do you think those changes will ruin the chowder?